PUMPS SAND AND SILT!!! The Super Twister 12 volt pump is capable of pumping up to 85 feet from at an amazing 1.0 gallon per minute from ground level by simply connecting the pump to a 12 volt battery. This Revolutionary 3 stage pump has a constant voltage booster (CVB) built into the pump. The (CVB) outputs a constant voltage to the Super Twister Pump motors which reduces voltage drop due to battery drainage. This means a more continuous and faster discharge rate! The Super Twister reliable design is suitable for continuous sampling or purging of groundwater wells. 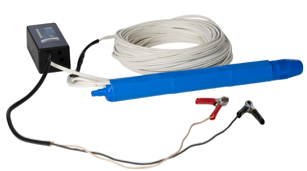 The Super Twister is not designed for use with the Low Flow Sampling Controller. The Super Twister can pass sand, small rocks and debris without getting clogged or damaging the pump motors! The Super Twister can run continuously without the need for a cool down! The Super Twister can also run dry for up to two hours without motor damage! The Super Twister has a long lasting 400 hour motor life! The Super Twister's (CVB) incorporates a Reverse Polarity Protection fuse. It has sleek outside that minimizes well hang-ups. The Super Twister comes ready for field use; with 90 feet of heavy duty wire and alligator battery clamps and it is shipped in its own box.